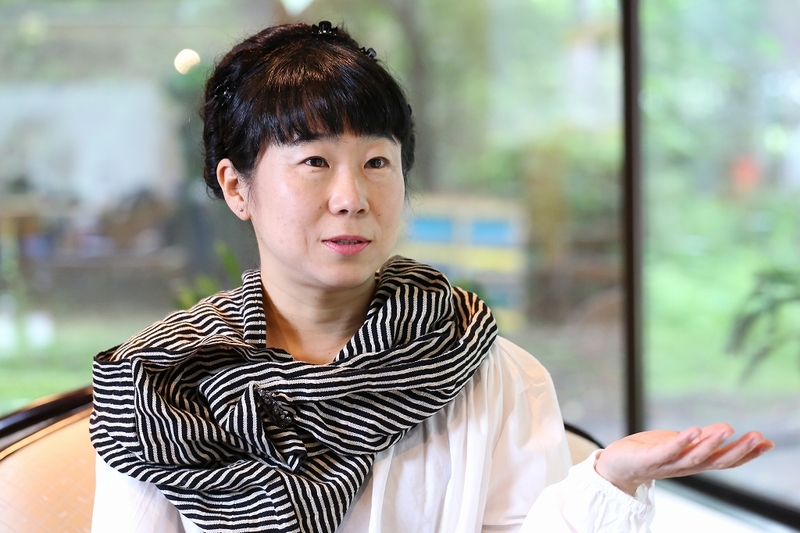 Artist Hagino Miho, who was born in Muroran but resides in Mexico, has co-produced a piece of work comprising footage and photographs on the theme of immigrants of Japanese descent – a book in which the expressions of those immigrants and the words inherited from their forefathers are impressive. On one side of a two-page spread is a portrait; on the other, the words of that person in Japanese, Spanish and English. The familiarity of their expressions may be due to the fact that the people are Mexicans of Japanese descent. “A Land of Memories”, is a book of photographs that was born from an art project by a unit made up of Muroran-born artist, Hagino Miho, and architect Taro Zorrilla, who has both Japanese and Mexican roots. For five years since 2008, they visited and interviewed Japanese immigrants and their children and grandchildren – people of Japanese descent – and created the images based on the footage they filmed. 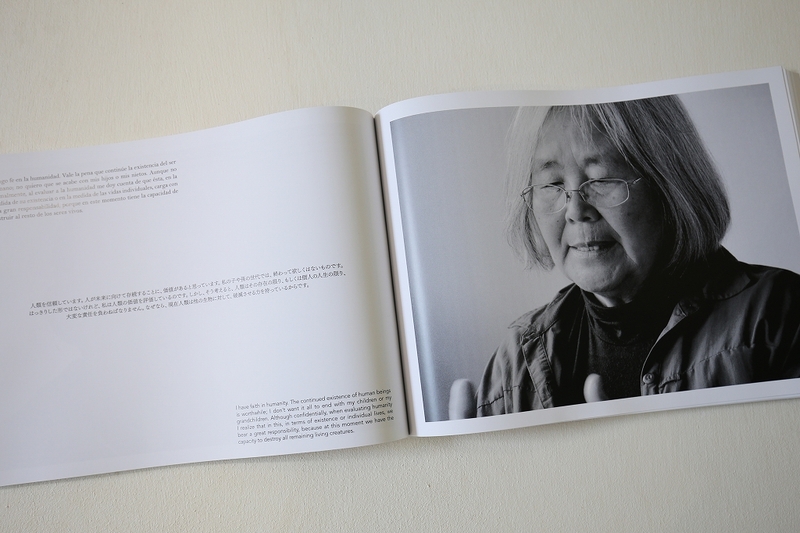 The book is a compilation of the photographs and words that were exhibited along with the footage. The book of photographs contains the portraits of 111 Mexicans of Japanese descent, as well as words regarding their identity and other things they learned from their immigrant forefathers. “First, purity comes from the heart”, “Never forget gratitude and appreciation” – words like these were inherited from their forefathers as something special, and it is comforting to know that they are being passed on to their children and grandchildren. As a Japanese, I wonder if I have words to inherit and pass on to my descendants. Hagino’s inspiration to become an artist came from Mexican art. After encountering the work of Mexican artist Frida Kahlo in New York, a series of coincidences led her to Mexico. In 1996, Hagino entered the graduate school of the National University of Art, Mexico, and subsequently studied contemporary art in Japan and the United States. In 2002, she returned to Mexico and is currently an immigrant. “I, too, am a new immigrant – a first generation immigrant,” she smiles. According to Hagino, “The creation of contemporary art is closely related to Western culture. For example, it’s difficult to perceive and reflect religious aspects that exist in the background of the society. However, the beauty of the behavior and words of the descendants of Japanese she encountered in Cuba reminded her that “it’s something that is within oneself”. “I tried to become more familiar with the things that are within me, and express contemporary art using my own methods.” That is when the journey to interview Mexicans of Japanese descent, began. The history of immigrants to Mexico and Central and South America began in 1897. From 1906 through ’07, approximately 9,000 people arrived in Mexico and they continued arriving until the 1970s. The immigrants themselves created the term “of Japanese descent” and discovered their identity in the new culture they developed. More than 20 years have passed since Hagino herself emigrated to Mexico, and she is also conscious of being “of Japanese descent”. All the photos in the book were taken in monochrome, and information on what generation of Japanese descent they are was excluded as far as possible. By just looking at their faces, it is unknown if they spoke in Japanese or Spanish. According to Hagino, “We wanted to express their existence using just words”. “The Japan that they speak about is different to Japan that I was born, lived or experienced; in their imaginations is something like an ideal country.” What Hagino and Zorrilla created is a small history that exists in each individual. With the records eliminated, the words of the individual memories that were extracted have reached our hearts by transcending the background of Japan, Mexico or Japanese descent. This is shareable heritage that transcends time and locations, and is Hagino’s contemporary art. The postscript of the book of photos contains a particularly memorable quote from one man. “The first time you understand who you are and what you are, I think lots of things – many of them good – start to emerge.